I’ve been following this fascinating conversation about blogging in the comments thread of a post on my fabulous friend Gwenda Bond’s blog, Shaken and Stirred. It particularly has to do with authors blogging. Some authors have dipped into the conversation, and it seems different people blog for different reasons, which is obvious, of course. Some authors, too, are suspicious of blogging, and see it simply as self-promotion. There are all sorts of ideas about authors and blogging in this conversation, and some of these ideas are really interesting. It does seem that many publishers these days encourage authors to keep a blog. It’s certainly one way to promote one’s work. Me? I started my blog (not this one, but one of those on my sidebar links) some years ago. Back in 2002, I think. I did it to keep in touch with my writing friends, none of which live anywhere near me (especially back then). So it was very personal. And I wasn’t very good at it, to be completely honest (and I don’t think I’m good at blogging now, either, to be completely honest). But there was a point in my life when blogging became very important: when I lived in Japan. In that period of my life, it was something I did regularly, and it served both as a typical “journal” would serve anyone–to capture a part of one’s life while they’re living it, because for some reason it feels extremely important to do so–and also it was a way for me to stay in touch with many of my family and friends, rather than to write individual e-mails to every single person I loved. About three or four months into writing about my life in Japan, a friend suggested I put a little visitor’s counter on my blog, to see how many people read it each day, and for how long, and where they are located, etc. I thought this was very silly, because I figured it would show a total of twenty to thirty people as visitors daily. But I was surprised to learn that in fact, at that time, around 150 people were reading my blog each day. Sometimes 200. Every now and then it would spike to 300 visitors in a day. I was a little taken aback, to be honest. Who were all these people? And why did they care about my little blog about living in Japan? They were from all over the world, actually. From a variety of countries. And that, too, was a real surprise for me. But to be honest, yet again, once I came home from Japan, I didn’t feel as much of a need to blog. For me, it really had been about keeping in touch with loved ones and friends who lived a world away from me. And once I returned home, even though many of my friends still lived far enough away to continue that purpose, I didn’t feel my life in America was anything to write about in particular, and that need to communicate all that I’d been experiencing in Japan began to evaporate. I still blog, but I don’t think I’m very interesting. My life is busy. I teach fiction writing full time at the local university. I’m also taking classes part time to earn another graduate degree. I’m writing my third novel. I’m gearing up to throw a party for the release of my second novel, and to go around the region and do readings and signings. I’m busy. But my life? Generally nothing spectacular, at least in my opinion. I have a lot of good friends, many of which I don’t get to hang out with as much as I’d like to since I started working full time and going to school for another degree full time. I have a large, loving family, many of which I don’t get to see as often as I like for the same reasons. Certainly, I could blog about my personal life in detail if I truly wanted to, and I sometimes do, but generally I don’t feel compelled to do so. I think partially it’s because I’m so busy. But also I think it’s because I like to keep some things for myself, you know? In any case, you should read the conversation thread I linked to above. And if you want to read me blogging at my best, you should click here, and start reading through the two years when I lived in Japan. That was bloggy me at my best, really. That was when it felt like an absolutely essential aspect of living for me. I laughed so hard I nearly cried. No, I did cry. I cried tears of…painful truth. And then I laughed some more. Link via Barth. Do you get sick and tired of hearing how Republicans apparently are better with the economy, with money, than Democrats, and how Democrats are perceived to be “spend, spend, spend”? Well, if so, you need to read the fabulous Scott Westerfeld’s (author of the Uglies series) blog post “Do the Math” on the website YA for Obama, where Scott does indeed do the math based on statistics for the past sixty or seventy years, comparing Republican and Democratic administrations (taking a wide variety of variables into account, like House and Senate majorities as well) and finds that, in fact, Democrats are hands down better at growing our economy than Republicans every time. He also explains how and why Republican administrations tend to run the American economy into the ground time and time again. They say they’ll lower taxes, and they do, but to make up for it, they borrow borrow borrow from other countries, and leave us holding the bag full of debt. To read the whole breakdown, go here. Some actual work to this site got done this weekend, partly due to the fact that the Toshiba laptop I’d been working on for four years finally went to laptop heaven, and I finally went out immediately after and bought myself the MacBook I’d been wanting to get for a while now. So in the midst of switching from Windows and getting used to my new tapping and typing tool, I fooled around with things here a little bit. Made a little banner for the top of the site, with a sample of an image from my next book’s cover. And also made a page on this site for the book itself, which you can find here, if you’re curious. On Friday I came home from work to find a slim mailer on my doorstep from my publisher. Inside was the cover flat for The Love We Share Without Knowing, and it made the rest of my weekend a little bit cheerier. I really like the cover design and the colors, a sort of black and white grainy filmic image of two ghostly characters with their backs to the viewer, and through their semi-transparent bodies you can see portions of Tokyo. I sort of love what that says in and of itself. And brown and black and smoky seaglass green colors in general wrapping around the lower half of the book. The fade to white above. And two blurbs on the back cover, too, one from Dan Chaon and the other from Michelle Richmond. 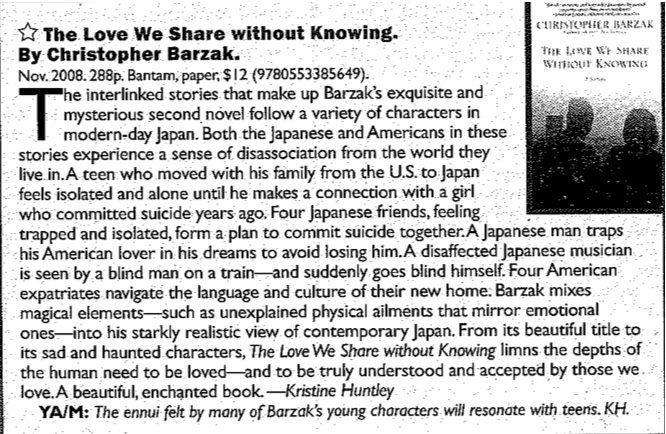 Really lovely, wonderful blurbs, which made my jaw drop and feel really honored when I read them. I’ve put those on the page for the book as well. A busy week ahead. Another one of those one day at a time weeks, I think, where I’ll try not to think too much about what I have to get done until I absolutely have to get it done. I am sooo looking forward to winter break already, even though it’s just now fall, and the trees are turning colors, and Halloween is here, which I love. Free time, right now, is way more attractive. After watching tonight’s debate, I am officially done with the political race. I don’t feel like I’m getting any more information from either candidate. At this point, I just hear the same catch phrases over and over. And I’m discouraged by their choices to continue limiting the form of the debates. First, McCain’s campaign negotiates for shorter response and debate times for the Biden/Palin debate, most likely so that Palin could recite her ABC’s for the nation more easily. And now, tonight, the debate was changed so that there could be no follow-ups between candidates, though Obama broke away from that at one point to correct McCain on various issues he had muddled through, decontextualizing Obama’s record as usual. My problem is, as a citizen, I feel that we deserve debates which force these candidates to actually think on their feet, to work through issues in front of us, rather than to recite memorized catch phrases, and in which they are forced to truly confront one another. Right now, I feel like I’ve gone to the circus. We’re being given the illusion of something wild and fantastic, but it’s all been rehearsed and rehearsed, is more artifice than reality. And I think reality is what we deserve as citizens about to make an incredibly important decision in less than a month. If this is all they have for us, we might as well go ahead and vote now. With a cold rain falling, the truck bangs along a gray road past weather-beaten houses raised on stilts. A few years ago, two-thirds of the village was finally connected to water and sewer lines; this is the one-third still waiting. Many residents, including Mr. Snyder, bathe with water retrieved from the Kuskokwim River and use honey buckets as latrines. Some of these malodorous buckets sit like garbage cans along the roadside. Read the entire essay at the NYT by clicking here. Two recommendations in one day! 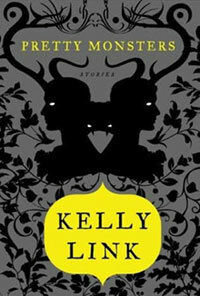 Today is the release of the fabulous (in all senses of that word) Kelly Link’s new collection, Pretty Monsters. You can read all about it (and some of the stories, too) by visiting the book’s website. And you can then go buy the book itself by going here or here or here.